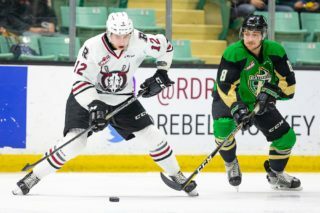 The Red Deer Rebels weren’t at their best Friday night at the Centrium, but the bottom line is they took advantage of their scoring chances in a 6-2 WHL win over the Calgary Hitmen witnessed by 3,797 fans. 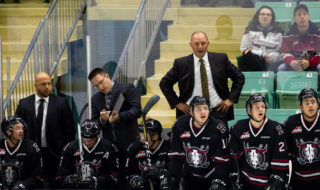 “I thought we were OK. We didn’t play great, we spent a lot of time without the puck, spent a lot of time in our own zone,” said Rebels GM/head coach Brent Sutter, whose squad was outshot nearly two to one (45-23). Granted, the vast majority of the visitors’ shot were of the low-quality variety, but Rebels netminder Ethan Anders still finished with 43 saves in a nice bounce-back performance after struggling in his two previous starts. “Our goalie was good, it was good to see him have a response from his last two games,” said Sutter. Anders stopped all 16 shots he faced in the first period as the Rebels raced out to a 4-0 lead. Jeff de Wit opened the scoring at 4:46 when he took a nifty backhand pass from Alex Alexeyev, who had moved down from the point, and ripped the puck into a gaping net. Brandon Hagel notched a power-play marker less than two minutes later, skating into the low slot after a faceoff win by Reese Johnson and ringing a shot off the post and past NHL goaltender Jack McNaughton. 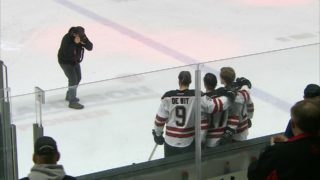 From there, de Wit potted his 19th of the season — and the 100th point of his WHL career — despite losing control of the puck on a breakaway and watching a Calgary defender slip the puck under McNaughton, and Chris Douglas scored on a perfect tip of a point shot by Ethan Sakowich. “We scored on some opportunities in the first half of the game but I thought we chased the game a lot too,” said Sutter. The Hitmen, who played with more pace than their hosts the last half of the contest, fell behind 5-0 on Hagel’s second of the night and 17th of the season, a power-play tally 5:30 into the second period. The goal was similar to his first, as Johnson won another faceoff in the Calgary zone and Hagel moved across the high slot and beat McNaughton to the glove side. 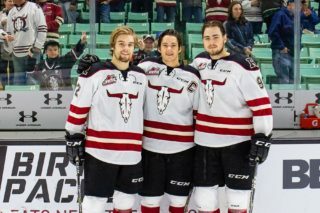 Red Deer native Luke Coleman got the Hitmen on the board when he cashed a rebound at 13:29 of the middle frame and Calgary captain Mark Kastelic buried a bouncing puck at 11:26 of the third period. Douglas rounded out the scoring with his second of the evening with 2:31 remaining, converting a centering pass from Oleg Zaytsev, his second assist of the game. De Wit didn’t play the last 10 to 12 minutes of the game while resting a nagging, but minor, injury. But the final result was basically settled at that point. The bigger news of the day was the Rebel’s acquisition of 19-year-old forwards Brett Davis and Cam Hausinger from the Kootenay Ice. 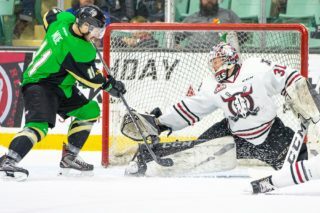 Davis, a sixth-round pick of the Dallas Stars in the 2017 NHL entry draft, had 25 goals and 58 points with Kootenay last winter and has produced seven goals and 19 points in 24 games this season. Hausinger, who played 41 games for the Rebels in 2016-17 before being moved to Kootenay last year, was 21-22-43 in ’17-18 and has eight goals and nine assists this season. “They are guys who can play in our top six forwards,” said Sutter, who gave up three players — Justin Svenson, currently with Swan Valley of the MJHL, Austin Schellenberg and River Fahey — prospect Chase Bertholet, 15, and five draft picks — a first, third and sixth in 2019, a second in 2020 and a conditional third in 2022. “They’re veterans who have been in the league for a few years, they’re more mature players,” added Sutter. The deal will also allow the Rebels younger forwards to develop at a more reasonable pace. “As the season goes on it doesn’t get easier and maybe it gets guys in places where they need to play,” said Sutter. “Just adding some more depth, experience and leadership, this will help the young kids too. Players will develop if they’re around better players.